Hot and very prolific Cayenne has thin 5-6 long pointed and wrinkled dark green fruit that matures to a deep red Excellent fresh, in sauces, and easy to dry to be ground to a powder Each plant provides a bountiful harvest. 100 Seeds. HOT PEPPERS: When Wilbur Scoville first devised a means to test the heat of peppers, his hottest entry then came in at 20,000 units. Habanero and Thai chilies can go as high as 60,000. Compare that to the sweet bell pepper at zero. When hot peppers are consumed, capsaicinoids bind with pain receptors in the mouth and throat that are responsible for sensing heat. Once activated by the capsaicinoids, these receptors send a message to the brain that the person has consumed something hot. The brain responds to the burning sensation by raising the heart rate, increasing perspiration and release of endorphins. Hot peppers should be eaten with caution! Cayenne Red Long Pepper: Hot and very prolific. 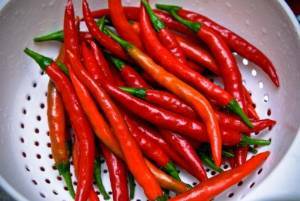 Cayenne has thin 5-6 long pointed and wrinkled dark green fruit that matures to a deep red. Excellent fresh, in sauces, and easy to dry to be ground to a powder for a spicy-hot condiment. Each plant provides a bountiful harvest.